FOTI #28: The Honey Badger Don’t Care! Fortnight on the Internets just takes what it wants! On this episode of FOTI, we throw our usual format out the window! First we discuss the hunt for the Boston Marathon bombers and all the fallout that dramatic event had on the Internet. Then, our collaborator Jeni Sue joins us to report on her adventures at Coachella. THEN, Randall, the expert in crazy, nastyass animals, especially the Honey Badger, joins us for a very special interview. With music from Skinny Lister and so many great contribs from our Likers! Before kicking off a content-packed episode, we start things off light with this amazing mashup of the most and least disappointing pop singles of 2013 thus far. AMAZING work by DJ Daddy K.
Mere moments after our last episode dropped, mayhem broke loose in Greater Boston and soon spilled onto the Internet. The drama, hysteria and blizzard of true and false information surrounding the manhunt for the Boston Marathon bombers required us to take an entire segment to unpack it. Some of the best (and the worst) reporting of this story was done via the Internet. For example, this article on Deadspin (and the amazing graphic above) is the clearest explanation I have seen of what exactly went down as the terrorists went on the run. Watching the Reddit detectives — we discuss the much-publicized (and futile) attempt by Reddit users to ID the Boston bombers. Here’s a good piece by James Surowiecki on the topic. The sad tale of Sunil Tripathi, the missing Brown University student who was falsely accused of the crime before being found dead a few days ago. Alexis Madrigal of The Atlantic skillfully dissected how the Tripathi meme began and spread across the Internet (with help from Buzzfeed) before being debunked by Pete Williams of NBC. When breaking news is taking over Twitter, is it OK to keep promoting your TV show or fun event? Certainly, some people now consider that a breach of digital etiquette. TBD if that’ll be the new standard. Can anything useful be gleaned from a killer’s Twitter feed or social media presence — or should we just consign their thoughts and names to the dustbin of history, denying them our attention as much as possible? 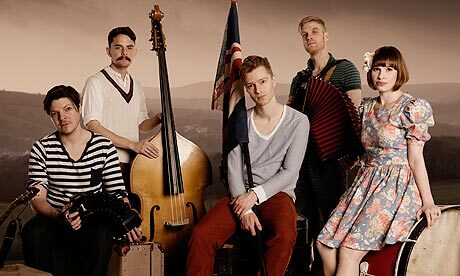 Coming off an appearance at the Coachella Valley Music and Arts Festival, it’s Skinny Lister! They have been named the Hardest Working Band in the UK and they have seriously played every music festival in England and the USA that I have heard of in my entire life. Even the Vans Warped Tour, if you can believe it. The album is FORGE and FLAGON and it’s highly recommended. Check them out on Facebook and at their own site. Our star correspondent Jeni Sue rejoins us with a report of her experiences at Coachella. For hilarious and detailed narratives of her adventure, be sure to check out her blog! Coachella’s crowd includes so many teens and tweens…many of whom ditched school on Friday, leading to a LA-wide school attendance crisis. Did you know there is a new drug called “pokeballs”? Kids these days! High tension in the security line as scads of young women hide drugs in their secret places. Desert Festival Fashion: “Midsummer Night’s Dream” wood nymphs for the ladies, short-short shorts for the guys. “Standards” that groups of people used to gather in the midst of chaos: giant sunflowers, pool noodles adorned with Christmas lights, Nic Cage’s face! You can always find Jeni’s genius on our Facebook page (look for her trademark “– jsb” tags) and on her blog, Not Lena Dunham. Randall the Honey Badger Guy! We’re joined by very special guest RANDALL, the internet’s foremost expert in crazy, nastyass animals! We thank Randall profoundly for joining us for this great convo. Find more great Randall magic on his Youtube account, on Facebook, on Twitter, and on his own website. Hey everyone — subscribe to us on iTunes and give us a rating to help more people find our podcast. Liker Lindsey found the great men’s follow up to the Dove Real Beauty ads we talked about on the Facebook page a couple of weeks back. Liker Jeremy C sent along the new volume of Date-A-Max! Likers Doan and Nate M sent along comedian Nathan Fielder’s “drug dealer parent confusion” text prank. 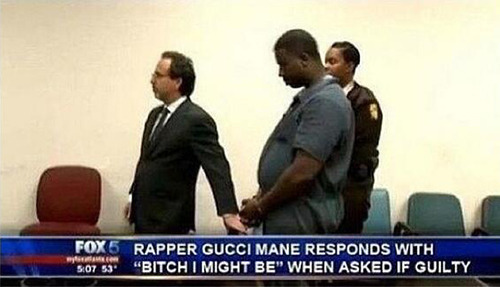 The dudes from Kissing Contest tipped us off to this hilarious screengrab of Gucci Mane in the courtroom. Their epic Reality Madness episode just dropped! Thank you, Liker Andrew W, for your always astonishing contributions to our Facebook page and podcast! Likers, you are magnificent. Thanks for listening, we’ll be back in two weeks.